Worldwide, people are experiencing noise problems from wind farms, and Nina Piepont’s research has been published in peer reviewed medical journal, and the wind industry’s story that people are not affected by noise from wind turbine noise is far from the truth. Early in 2007 Stanwell, Queensland Government owners of the Toora wind farm, bought Les Osbourne’s house which was about 600 metres or so from the nearest turbine and then buldozed the house. Les was originally in favour of Stanwell building turbines all around him, believing the spin about there not being any noise problems. In fact he signed the petition in favour of the windfarm 5 times. Once the wind farm was built he started to suffer from the noise. 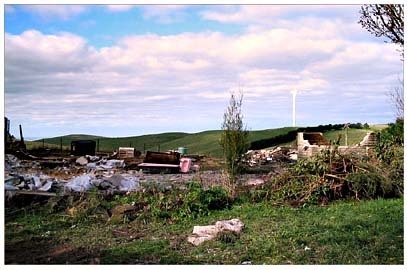 The house, being demolished in the photos, is just across the road from Jayne & Steve’s place who also suffered from the low frequency noise so much it affected their health and the company was required to institute temporary shutdowns of turbines. And why is it the Brumby government does not want to use current noise standards and the wind industry is reacting so strongly against a national code for wind farm development. JOSEPHINE CAFAGNA, PRESENTER: Victoria got its own version of the mining tax debate this week (28/05/10). The wind power industry joined the State Government in claiming the Opposition’s new wind farm policy would wreck Victoria’s renewable energy sector. LANE CROCKETT, PACIFIC HYDRO: It would have such an impact that it’s unlikely that any new wind farms would get built in Victoria. STEVE GARNER, KEPPEL PRINCE: It’s the loud minority who actually are being heard in this instance. MATTHEW STANLEY, REPORTER: With some of Australia’s biggest wind power companies watching on, John Brumby painted Ted Baillieu as an economic and environmental vandal. JOHN BRUMBY: At a time when the world is facing up to the challenge of climate change, we’ve been on the front foot with the right policy, creating jobs and opportunities for Victorians. All of that, all of that and more would be put at risk by Mr Baillieu’s policy. MATTHEW STANLEY: The Coalition’s promise to stop wind turbines being built within two kilometres of homes without consent would, they claim, mean there might never be another one built in Victoria. LANE CROCKETT: Expansion and renewable energy is consistently polls very highly and it’s very highly supported by the community and all people. MATTHEW STANLEY: Wind power is the only renewable energy being produced in Victoria on a commercial scale. 266 turbines across 10 sites produce about 450 megawatts. Another 850 turbines have been approved which, if they go ahead, will produce another 1,500 megawatts of power – almost the capacity of the Hazelwood coal-fired power station. And applications are pending for a further pending 900 turbines. TED BAILLIEU, OPPOSITION LEADER: Well it’s just not right. I mean, they are making it up. MATTHEW STANLEY: Yesterday the Opposition countered with a cheer squad of its own. Holding a media conference on the steps of Parliament with people who claim living too close to wind farms has affected their quality of life and in some cases, it’s made them sick. TED BAILLIEU: These are people with real issues, they’re in real locations with real lives and real problems and if they are ignored then the Government’s doing what it does best: just taking people for granted in this state. We’re not gonna do that. We’re gonna be responsible. And we are going to ensure that there is a balanced approach. It can be done and it will be done. MATTHEW STANLEY: Stuart Olsen’s kitchen table, strewn with plans for two wind farms, one either side of his house. STUART OLSEN, BRISBANE RANGES LANDSCAPE GUARDIANS: We’re in between both. So, yeah, we’ve got – 1,500 metres is the nearest to the east and about 800 metres to the west. KEVIN RAMHOLDT, BRISBANE RANGES LANDSCAPE GUARDIANS: Rather than being just a strictly objectionist group, like, it’s more like a network of people who are fighting similar issues. So, what that does is helps us sort of disseminate information and everyone’s got sort of the most up-to-date information that they can actually get. MATTHEW STANLEY: The landscape guardian’s wind farm horror story is the experience of people living next door to the state’s biggest wind farm at Waubra. Since Waubra started operating, dozens of people have complained of a range of ill effects, from being kept awake by the flicker of windmill blades to debilitating headaches and nausea. TRISH GODFREY (Sept. 2009): Basically, the best way I can describe it is that you feel you’ve got motion sickness. But it’s not just for a little while, it’s all the time in varying degrees. It feels like my head is in a vice. I can’t remember the last night that I had a full night’s sleep. Usually we wake up at least five or six times during the night. MATTHEW STANLEY: After this story went to air, the wind farm operator, Acciona, bought Trish Godfrey’s property. She was required to sign a confidentiality agreement and the company accepted no blame. But the case has helped fuel concern about new projects. LANE CROCKETT: There is no evidence whatsoever in any peer-reviewed article or medical assessment that says there’s any health affect from wind farms. The reality is the Opposition consulted with a radical group anti-wind farm lobby group that in itself goes around and spreads, you know, information that’s not correct and to me it looks like it’s designed to scare some of the residents into not accepting wind farms. MATTHEW STANLEY: The Opposition says simple economics is the industry’s real problem. MATTHEW STANLEY: While the Government was keen this week to focus on the Opposition’s wind farm policy, it will soon be asked to sign up to new national guidelines. The draft guidelines include proposed standards for inaudible noise or infrasound that are also strongly opposed by the industry. JOHN BRUMBY: I haven’t seen them, so, I understand they’re not finalised. MATTHEW STANLEY: If two kilometres is too far, what’s a reasonable distance for a turbine to be placed from a residence? JOHN BRUMBY: Well that’s a matter for individuals and a matter to be sorted during the planning process. LANE CROCKETT: Really the next thing is to talk to the Opposition and try and understand where they’re coming from. I guess if they were to just stand where they are now and say, “We’re not gonna change a thing,” even when they, you know, have a good understanding of the impacts, then I guess we’ll sit down and figure out what to do next.